Disparity Index is a versatile technical indicator developed by Steve Nison. It can be interpreted in many ways to find the entry and exit signals while trading forex.This technical indicator indicates the oversold and overbought situations. Along the post I will explain the technique of trading forex with this technical indicator. With this technical indicator, a buy order can be place when the indicator gives a reading at oversold level, and a sell order can be placed when the indicator gives a reading at overbought level. In other way, when the indicator reaches overbought level, and comes back to crosses the zero line from up, a sell order can be placed.And when the indicator reaches oversold level and comes back to crosses the zero line from down, a buy order can be placed. I think the above two techniques of placing orders with this indicator is not effective enough. The most effective orders can be placed with the bullish divergence and bearish convergence techniques. A buy order is suggested when the indicator indicates oversold condition. A buy order is suggested when bearish convergence is found. A buy order can be placed when the indicator crosses the zero line from down. A sell order can be placed when the indicator crosses the zero line from up. A sell order is suggested when the indicator indicates overbought condition. 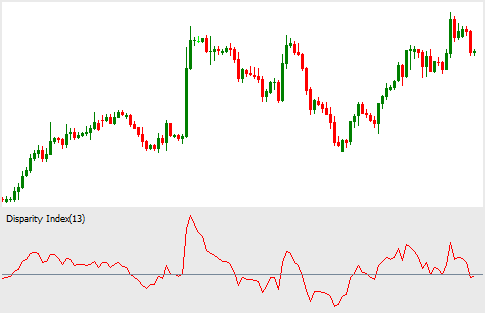 A sell order is suggested when bullish divergence is found. Disparity Index indicator can be used by any types of traders. The default period of this indicator is 13, but longer or shorter period can be applied as required. If you want the signals frequently, you should select shorter period. And if you want infrequent but accurate signals, you should select longer period. Everything depends on your trading strategy and objective. If you have any suggestions, questions, or complements, please drop a comment below.